UNITED NATIONS -- U.S. Secretary of State Mike Pompeo said Friday that he and President Trump remain "upbeat about the prospects of denuclearization of North Korea" and that "progress is happening." On what the U.S. needs to see happen going forward, Pompeo said, laughing, "It is really pretty straightforward." North Korean leader Kim Jong Un told Mr. Trump and South Korean President Moon Jae-in "that he was prepared to denuclearize," Pompeo said. Pompeo made the remarks after he and U.S. Ambassador to the U.N. Nikki Haley met with the U.N. Secretary General as well as with Japan, South Korea and the entire U.N. Security Council on Friday to address a crescendo of domestic and international concerns -- and confusion -- about U.S. foreign policy and the recent summit between Mr. Trump and Russian President Vladimir Putin. The meetings focused on what the summit means for North Korea and its nuclear weapons. South Korea's Foreign Minister Kang Kyung-wha was upbeat and firm when asked by CBS News on Friday whether North Korea will actually denuclearize. "They have made a clear commitment on complete denuclearization repeatedly and of course very forcefully at the Singapore summit with President Trump, and we will hold them up to that commitment," the foreign minister said. Since the June summit in Singapore between Mr. Trump and North Korean leader Kim Jong Un, North Korea has not tested its nuclear weapons or launched missiles. At the time, Kim committed to "work toward denuclearization." "Now North Korea and the U.S. have started to have talks," she said. "We and the Security Council and the international community have to support those talks, and the best way to support those talks is to not loosen the sanctions." At the U.N., however, there is a tug of war with Russia and China about easing sanctions. 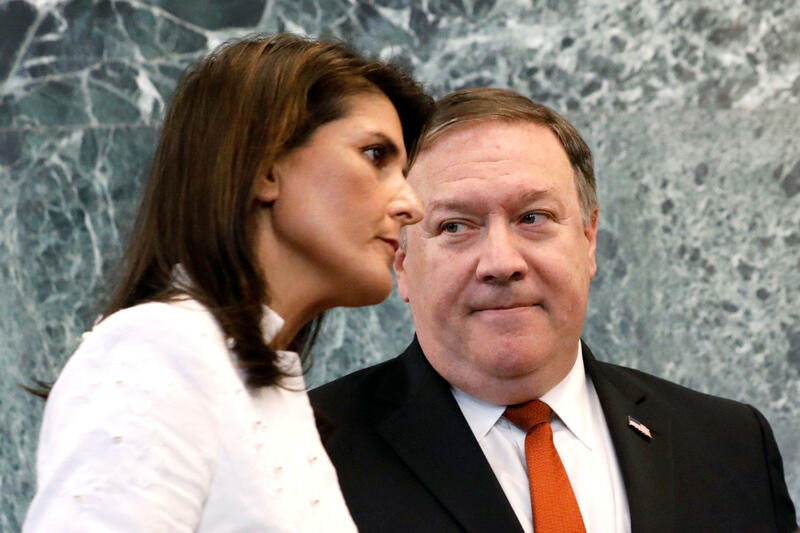 Haley is doing heavy lifting in an effort to show the Security Council that North Korea is in "breach" of sanctions that cap the transfers of refined petroleum products at 500,000 barrels a year. On July 12, Haley's office sent evidence to the U.N. committee tasked with sanctions on Pyongyang that showed that North Korea breached U.N. sanctions by surpassing the annual cap for petroleum products, documents obtained by CBS News revealed. The U.S. report cited China and Russia for continuing to sell refined petroleum products to North Korea. "These sales and any other transfer must immediately stop," it said. On Thursday, Russia and China foiled U.S. efforts to act on the report. They informed Dutch Ambassador to the U.N. Karel van Oosterom -- who chairs the U.N. committee on North Korea sanctions -- that they were requesting information on each of the 89 transfers, essentially delaying the "halt" on the illicit transfers that the U.S. wants. Committee rules allow up to a six-month delay, with the possibility of three additional months, van Oosterom told CBS News. On Friday, Haley said that no additional evidence is needed. "As chair of the sanctions committee on DPRK, we think it is very important that the Security Council remains closely connected to political developments on the Peninsula so that is why we welcome this conversation," van Oosterom said, referring to an acronym for the formal name for North Korea, the Democratic People's Republic of Korea. A committee member told CBS News that North Korean ships turn off their satellite tracking devices as they enter ports, making the evidence less than precise and enabling the subterfuge. Russia and China, in late June, attempted to pass a statement at the Security Council that would have proposed the easing of sanctions on North Korea. The U.S. nixed that statement within hours of it being circulated, but the divisions continue. Asked if Russia is reneging on a promise made by Russian President Putin in Helsinki that he would help on North Korea, Pompeo said, "Enforcement of sanctions is a continuing process, there are many places where the Russians have been helpful ... and we are deeply appreciative of that." "What we need now, though, is we need to continue that," Pompeo said. "The problem that we are encountering," Haley said, "is that some of our friends have decided that they want to go around the rules." "We put pressure today on China and Russia to abide and be good helpers." Haley added.